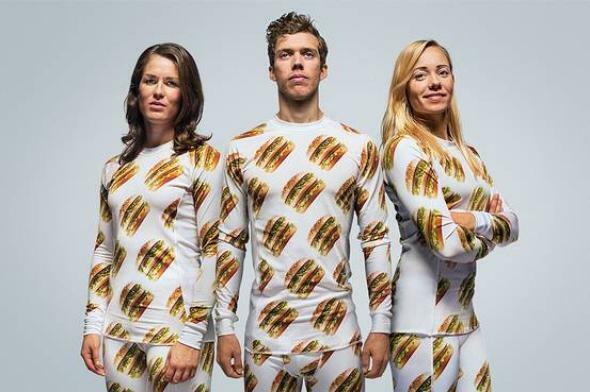 McDonald’s launches Big Mac fashion line in Sweden. The McDonald’s fashion line featuring the Big Mac. McDonald’s is having a bit of an existential crisis at the moment. Its sales numbers continue to slide—perhaps because the exchange rate for “lovin’ ” isn’t what they anticipated it would be—and the company is looking for ways to reinvent itself, to make its glorious comeback. Until that eureka moment dawns on the company’s executives, here’s their interim big idea to get the mojo flowing again: a Big Mac fashion line. If the internal company memo announcing this grand plan wasn’t titled If People Don’t Like Eating It, Maybe They’ll Like Wearing It—it should have been. The online shop launched in Sweden this week because Swedes apparently have already bought everything else in the world or were just in the market for some hamburger-themed wallpaper. Along with Big Mac wallpaper these are also burger thermals and linens for the Big Mac–lover in your life. Unlike the McDonald’s menu, these lifestyle accessories are not cheap—most of the products are in the $50 range. While the clothing line probably isn’t the silver bullet to restore the company to profitability (the proceeds go to Ronald McDonald House charities), at least we can look forward to a higher quotient of hipster irony out of the company. Because that’s what this is, right?